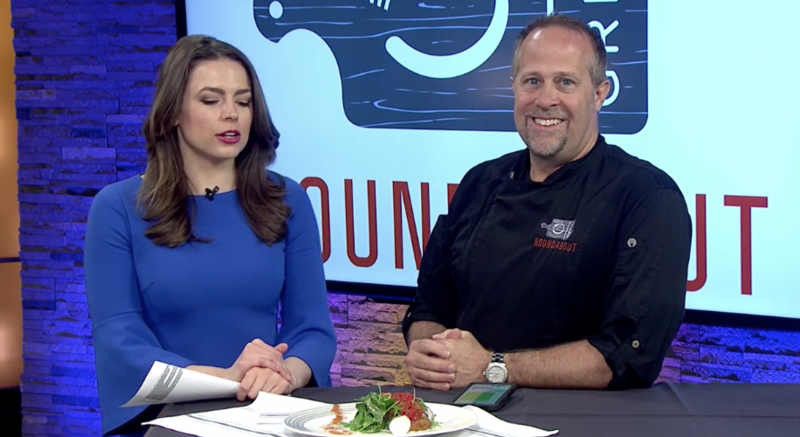 Roundabout Grill has joined the Reno Vegan Chef Challenge. The mission of Vegan Chef Challenge is, “Bringing Vegan Dining into the Mainstream.” Local chefs are challenged to create new healthy, tasty and satisfying vegan dishes which can appeal to all diners, not only vegan diners. Chef Colin talks about this delicious vegan dish on Fox 11 Reno that will be featured in April. The dish he showcased is a falafel with taziki and shawarma bites, accompanied by micro cilantro and roasted red pepper salsa with mixed greens.